We are now enjoying long dark evenings and are once again getting into the swing of imaging well into the early hours – weather permitting. The imaging object I have chosen for this month is the famous Double Cluster in the constellation Perseus. 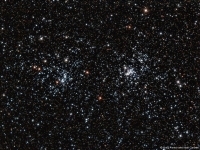 The Double Cluster as the name suggests is made up from two beautiful open clusters, NGC 869 and NGC 884. Walter Scott Houston in his Deep-Sky Wonders book has this down as a January object, but I find I have to have a go at looking/imaging this one the second it comes into a favourable position in my skies. The usual description of this amazing object, when viewed through a low-power eyepiece is “Diamonds on Black-Velvet” – and I clearly recall my first observation of the Double Cluster throught the C11 was precisely just like that. It is an incredible sight, and it is even a naked eye object appearing as a fuzzy glowing region near Cassiopeia. In fact it is such an amazing visual object that CCD images rarely do it justice for reasons that will become apparent as we carry on examining this region. If you use a low powered telescope, or better still a pair of 10 x 50 binoculars to look in the Double Cluster region, something very odd immediately strikes you. Like ornaments on a charm bracelet the Double Cluster sits on the edge of a bright ring of stars which leap out at you when viewed through binoculars. Now look at this region on a star map or planetarium program. Although you can make out the ring of stars that make up “Greg’s Charm Bracelet” – they are by no means conspicuous, and don’t show themselves to be clearly differentiated in any way from the myriad of background stars in the region. So this is clearly some sort of subtle eye-brain processing going on which makes the “Bracelet” so very clear when visually observed. There are plenty more asterisms that “pop out” when observed through binoculars, but effectively “hide away” when looked at on planetarium programs and star maps – Kemble’s Cascade immediately comes to mind. 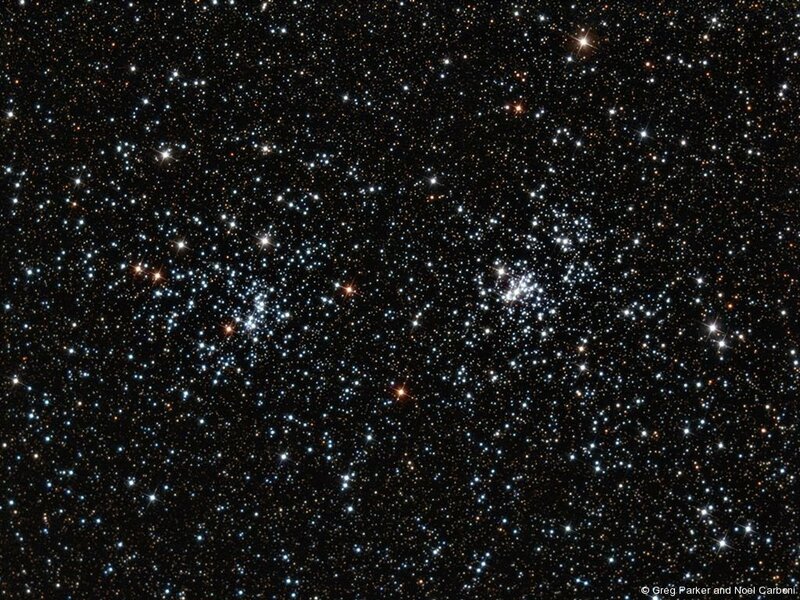 I think it is similar subtle processing by the brain-eye system that makes the Double Cluster itself so very striking. Returning to imaging the Double Cluster, it is a matter of getting a large number of subs at maybe 2 or 3 minutes per sub, under Moonless conditions. We can of course image clusters with the Moon up, but if we are trying to get that “Diamonds on Black Velvet” image, then we want the darkest skies possible. It is also worth going as deep as possible as well in order to pull out the impressive dark rift that runs between the two clusters adding further to the contrast when viewing this region. For a nice noise-free image it is worth trying for at least 100 sub-exposures which means spending up to maybe 5-hours imaging the Double Cluster. If you end up with an image that even approximates the view of the real thing – then it’s 5-hours really well spent.